You can restore vCD VMs from the backup to the VMware vSphere infrastructure. 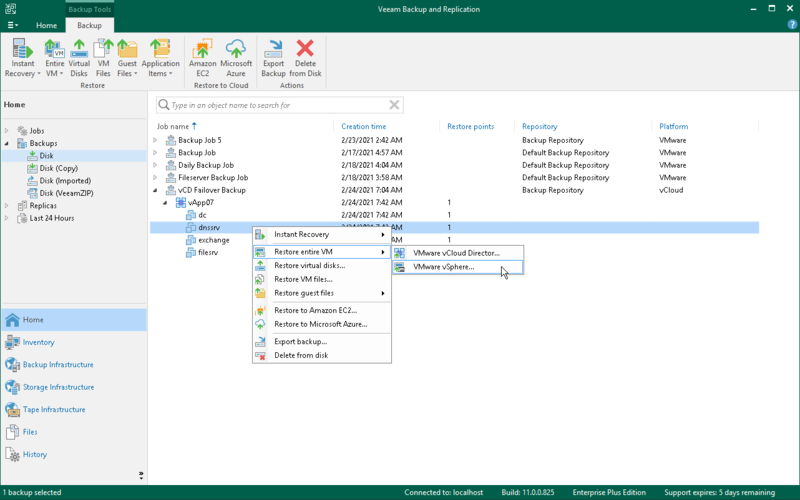 During restore, Veeam Backup & Replication neglects the vApp metadata saved to the backup file and performs a regular entire VM restore process. The VM is restored to the vCenter Server or ESX(i) host and is not registered in VMware vCloud Director. vCloud-specific features such as fast provisioning are not supported for such type of restore. Open the Home view, in the inventory pane select Backups. In the working area, expand the necessary backup, select the VMs you want to restore and click Entire VM > Into vSphere infrastructure on the ribbon. Open the Inventory view. In the inventory pane, expand the VMware vCloud Director hierarchy and select the vCenter Server. In the working area, right-click the VM you want to restore and select Restore entire VM > Into vSphere infrastructure. Entire VM restore of vCD VMs does not differ from entire VM restore of regular VMware VMs. For more information, see Performing Entire VM Restore.